This is my favourite ‘grow it forward’ plant and although I have seen this plant more prolific than it is at the moment, the fact that I still have it at all is almost a miracle. Look at those gorgeous little hearts. 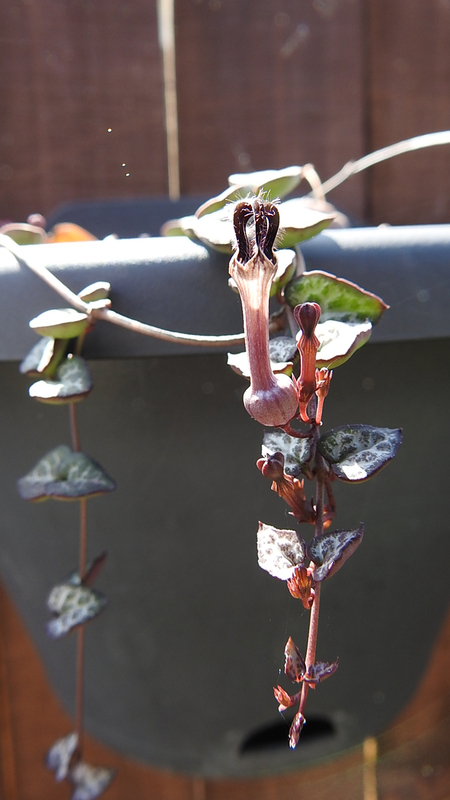 Whether you call it a string of hearts, the rosary vine, hearts-on-a-string or sweetheart vine, there is no doubt that Ceropegia woodii is a cute little plant and like a lot of plants I have in my garden, Chain of Hearts – the name I’ve always known it by – also belongs to the dogbane family (Apocynaceae). I’ll forgive you for thinking I have something against dogs, but that’s not true. I love dogs, I just don’t own one. But back to today’s story. 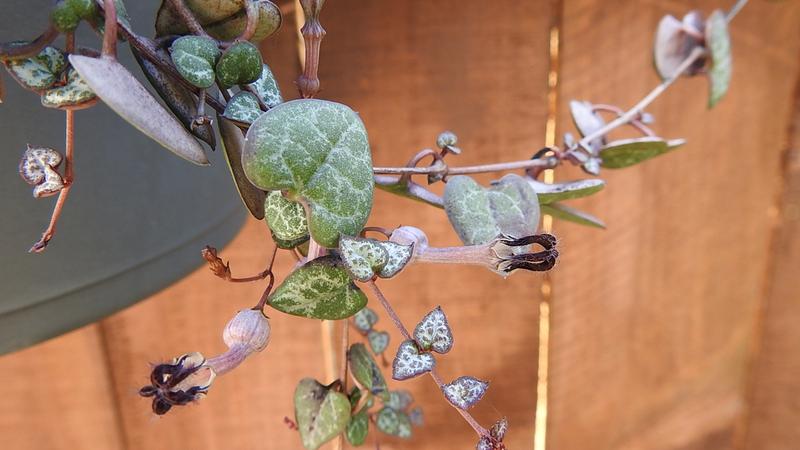 Chain of Hearts is a trailing vine that can grow to be 2 – 4 metres long (6.5 to 13.1 feet), and those pretty little heart-shaped leaves are a deep green with variegated silver markings. It makes for an unusual hanging plant, or even an indoor plant, however, the leaves do need direct sunlight to develop that deep green colour – indoors they can appear pale green. Mine is in a hanging pot amoungst all the others attached to the fence in my verticle garden and (at the moment) it receives about six-eight hours of direct sunlight – when it’s not raining. I can’t even begin to describe these little flowers correctly because I’m not sure what’s petal or sepal. Flower surrounded by new growth and lots of buds. At the base, the flowers are tubular with five separate segments that are a pretty pale magenta in colour. They appear to be fused at the tips, just like many other species in the Ceropegia species and have another five segments on top that are a deeper purple. They are rather cute and can grow up to 3 centimetres (a little over 1 inch). The plant develops a large tuber where it’s rooted in the soil but also grows nodes or nodules along its vine. These make it so easy to propagate. Simply take a cutting that includes a nodule and if you ensure you bury that nodule and provide it with just enough water (it dislikes too much), it will quickly take root and develop into a new plant. At least that’s what it does in tropical or sub-tropical climes. I have never needed nor have I ever used growth hormone to assist this process. A long time ago, in what now seems like another lifetime altogether, my dear friend Debbie gave me a cutting from her plant. I’d adored her Chain of Hearts, not quite from afar, as I’d always touch it and ooh and ahh over it every time I visited, so naturally, I treasured the precious little gift she’d given me. This was in the late 80’s and we were living in Townsville in north Queensland, right in the middle of the tropics. I took that little cutting home and did as bid, buried the nodule in a pot and waited for it to take root and sprout new life. And that it did. My plant flourished and soon became the envy of my friends when they visited. Many pieces of that plant were given away for others to ‘grow it forward’ and when we moved from Townsville to Brisbane in 1993, my Chain of Hearts travelled with us, safely nestled at my feet. For the next 20+ years, it remained with me, with us, through the three different homes we owned and the three rental properties we occupied. Over the years it also went through many varying degrees of health and at one stage was nothing more than the tuber below the soil. But, having neglected it to the point where it tettered upon the edge of extinction, I persisted (or prayed) and bought it back to life. In October 2014, when preparing to leave on our trip around Australia, I entrusted it into the care of our eldest daughter Kate. As most of you already know, Dean and I were on the road for almost two years and it would then be another nine months before we moved into our new home on the Sunshine Coast. Not wanting to be an ‘Indian giver’, and seeing how much Kate loved the plant, I simply took a cutting – breaking off a piece that contained a nodule – and buried it in a pot, crossed my fingers, and hoped for the best. That was just over 18 months ago, and it has now reached the point where I can once again start taking cuttings and presenting them to friends as a ‘grow it forward’ gift. Being a Chain of Hearts I believe it makes a wonderful gift from the heart. Do you have a ‘grow it forward’ plant? I’d love to hear about it. If I cast my mind back, I firmly believe Debbie gave my that cutting in late 1988. That makes my little Chain of Hearts 30 this year – I think it needs a present – perhaps a little Osmocote treat. That’s lovely Sue. I too have been naming some of my plants after their owners. I remember exactly who gave me what and can tell you where every plant came from, whether it was a gift or a purchase, and love introducing visitors to Peppermint Patty – my hoya that came from my Aunty Pat’s garden. If we ever have our own property again I’d like to have this plant. I also really like Dicentra spectabalis with its lines of hearts, so with both plants I could have lots of hearts!